It all started with this horrid rust stain inside my toilet. (I never thought I'd begin a post with those words!) You see, we have well water and it is quite hard. No matter the amount of toilet cleaner, Soft Scrub with Bleach and Daivd's elbow grease applied, this stubborn ring around the water line in my toilet would remain. After my mom came to visit last week, I was quite embarrassed about this nasty stain... and it really was a clean toilet, it just didn't look like it! 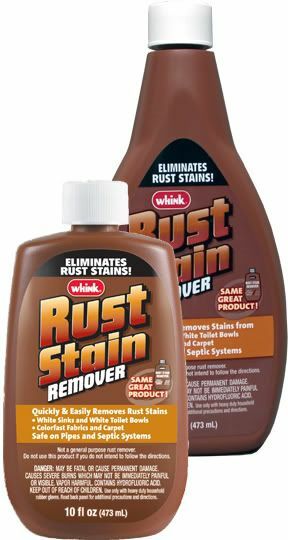 Well, wouldn't you know it, just as soon as she left I found this product at Wal-mart: Whink Rust Remover. After about 20 applications-- pouring it on, letting it sit, and then flushing-- a little light scrubbing made that horrid, ugly ring of nastiness disappear! Oh it really IS a sad day when I post about this, isn't it?! Then why oh why am I so happy about it all? Good grief, I am such a dork. I better stop before I start sounding like an infomercial. And I won't mention the excitement when I found these XLT undershirts online... and that David actually thought they were super comfortable. Have you tried finding undershirts in Tall sizes lately? Hard to find and super expensive. But these were great. Okay, I'm going to go now. I don't know when I turned into an old person that would get so excited about these kinds of things. Maybe I'll think of something fun to post about tomorrow to redeem myself from the depths of dorkdom. He has potential, really he does!